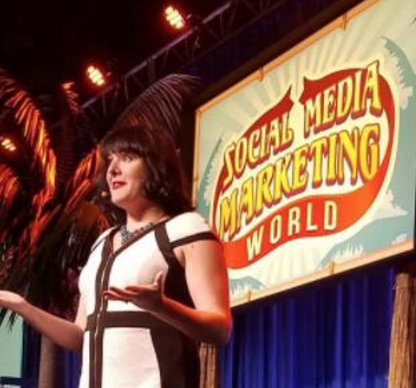 Top Tips and Trends: Social Media Marketing World Recap! Holy smokes, what a week at #smmw17! I've taken the best takeaways and put them into one big ol' video so that you can market like it's AT LEAST 2017! Things are changing and it's time to move with the cheese! As usual, I'm loving the BeLive.tv platform on this vid! Scroll below these show notes to check it out. Big shout out's to the following Social Media Rockstars mentioned in this video – Social Media Marketing World, Social Media Examiner, Mari Smith, Her Smart Marketing, Ashley Ryan, Bruce W. Spurr, Pia Cohn Larson, Claire Winslow, Ian Anderson Gray, Phil Mershon, Amy Schmittauer, Steve Dotto, Anne Popolizio, Kelly Nobel M. Leonard Patton, Natchi Lazarus, Switcher Studio, Christopher Penn, Andy Falco-Jimenez, Roberto Blake, Chalene Johnson, Sue B. Zimmerman, and Gary Vaynerchuk. Oooo – and extra shout out to iOgrapher who I FORGOT to mention in this video Gah!!! I can't wait to get my hands on the new goodies that are on their way! Dave B. is a video tech master!!! Here's a quick bullet pointed list of everything I covered in this video! It’s important to get your audience from Facebook off of Facebook and onto your email list, mailing list, etc. There are a million ways to use messenger! IT'S ALL ABOUT PROVIDING VALUE! (27:58) If you’re providing value and using Facebook Live, it’s a way to “trick” the algorithm. (32:59) This is reality! Market in the world we are living in and be in the forefront of it. Holy smokes – that was a lot!! Ha! What an awesome experience it was to be involved with SMMW this year, and to consume as much content as possible. I'm so happy to be able to share it with you. So, go put it to use! Connect with other people, be your true authentic self, be brave, step into your spotlight, be real and celebrate others. Planner pleas. Note me Baby! I’m not a fraud! LOL!!! Note me! Thanks Molly!!! Love learning from you!!! molly, you are so cute!!! Yes, it’s awesome. Love the video too. Automated response based on keywords? I’ve been talking to Frank Kern for a week in Messenger. Really. Not really. Pia Cohn Larson , no… it’s a bot. Messaged you! Have all these things existed before and we didn’t know about?? Are theses new tools? Or have they always existed?? You are so not a regular person!! LOL!!!! I’m in the program too, yeah!! YOU need to speak in 2018 girl! Did a video like that thought no one would really watch tons of likes on it. It definitely got their attention! Awesome! I’ve been teaching people how to do that using Free Open Broadcaster Software! We need postables on fb make it happen molly if anyone can you can! Haha! Yes! I’ll get you the link! Would love the Messenger info! HI! I now have a full messenger training! http://www.AutomateMessenger.com Yay! Note me, baby!! You rock! I’d love to join the BeLive group! I would love to be added to the Be Live group! Ha! Yes! Paige Sealey is ROCKING my blog life! Fraud, I want it all. Molly, can you send me a copy of your notes, the planner, and whatever else you have from your take aways? I missed your live, so I watched the replay. Thank you! Yay! Yes! Here’s the planner, http://www.VideoContentPlan.com I’ll send the rest sooon! Molly how often does your sister do a text campaign… i find the group texts so annoying and if if I get a coupon for certain things that i’ve used before, i usually just delete it. so what does she do to engage the people right away? what’s her tag line?